Have you forayed into the DIY world of salt and sugar scrubs yet? Deliciously easy; most ingredients you may already have around the house, and no unpleasant preservatives/chemicals/sketchy “fragrances” found in many store bought products. 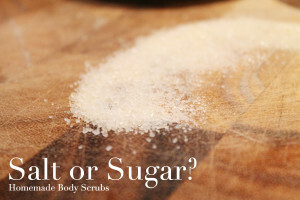 The two most common face and body scrubs use salt or sugar. But there’s a little more you should know. When making a salt scrub make sure to use sea salt, not regular table salt. Sea salt helps draw toxins from your body and can act as an anti-inflammatory if you suffer from sore muscles. Because the edges of sea salt granules are relatively sharp, the scrubs should be reserved for the less sensitive areas of your body; such as elbows, heels, legs, etc. Stay away from any sensitive areas with a salt scrub and avoid using it altogether if you have any skin abrasions or very sensitive skin. 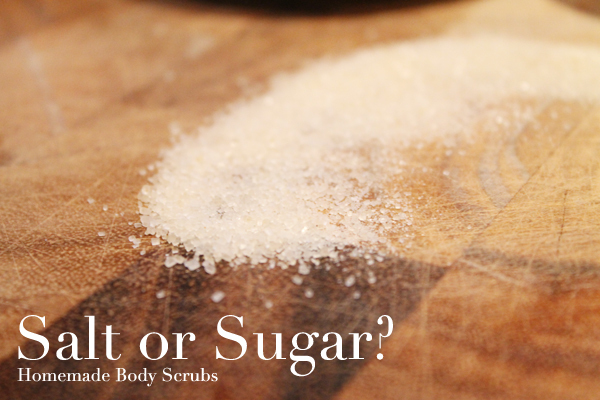 Sugar scrubs can be made with table sugar as well as with unrefined sugar or brown sugar. Table sugar granules are rounder than those of sea salt which makes them better for use on the face as well as other sensitive areas on your body. It makes a great mild scrub since it dissolves rather quickly in water and it leaves your skin feeling super soft. Unrefined cane sugar is slightly more abrasive than table sugar, but it’s still not as irritating to your skin as a salt scrub can be – It can be used all over your body to keep it soft and smooth, but you should avoid using it on your face (especially if you have sensitive skin). Brown sugar has the added benefit of smelling heavenly, and the scent will linger on your skin, making you smell delicious! 1 mashed banana or several mashed strawberries, 3Tbs sugar, a dash of vanilla extract or a few drops of your favorite essential oil. Massage on while in the shower and rinse off with warm water. Mix equal parts brown sugar with your favorite natural oil (olive, coconut, sunflower, etc) and apply to body, then rinse off. Mix equal parts sea salt and your favorite oil, then add a drop or two of your favorite essential oil, or try 1tsp of combined orange and lemon zest for an invigorate body scrub. Massage onto dry rough skin, inhale deeply, and rinse off.